In a good sized casserole pan heat a few tablespoonfuls of the olive oil, sauté the chopped onion (or leeks ) until soft and starting to turn golden. Add the washed spinach and allow to wilt slightly. Add the herbs and mix well; now add the tomato juice,remaining olive oil and seasoning. Bring the mixture to a gentle simmer and allow to cook for about 15 minutes -it may be necessary to add a little water. Put the rice in a separate saucepan with plenty of water and a teaspoon of salt. Bring to the boil and allow to cook for 5 minutes. Drain well. 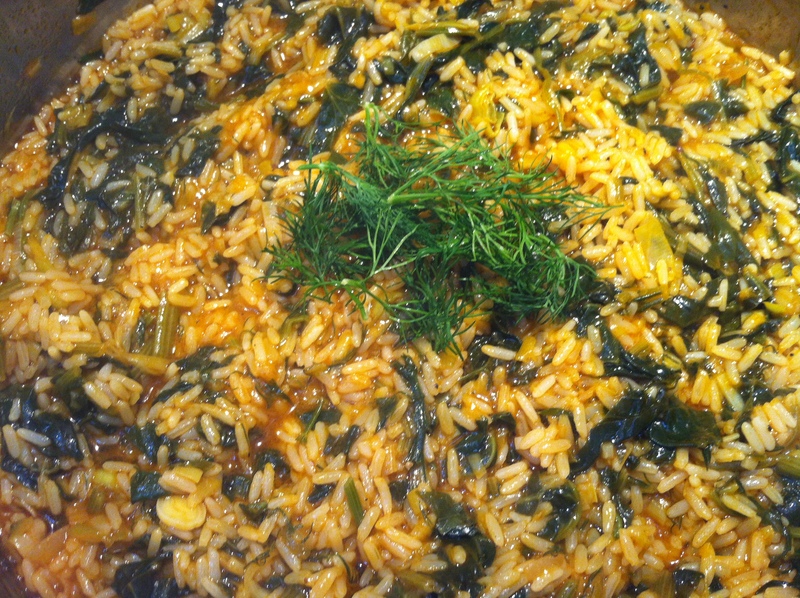 Add the drained rice to the spinach-tomato mixture and allow to simmer for a further 10-15 minutes or until the rice is cooked, stirring occasionally to ensure that the rice doesn’t stick and adding a little water as required. Serve with a drizzle of olive oil, and plenty of ground black pepper. The perfect side dish is a good, firm feta cheese and bread.